So…what exactly is the Pack Test? The pack test might seem a bit intimidating to those new to fire, and at first blush, it does seem a bit challenging. A 45lb pack is heavy. Three miles is a decent distance, and 45 minutes seems like a stiff pace. The truth is, if you’re training hard for the fire season, the pack test will be the easiest thing you have to do during the first few weeks of the season. That being said, you shouldn’t ignore it, and if you’re new to fire, you DEFINITELY want to go through a few dry runs just to get used to it. All hotshot crews conduct their pack tests differently. 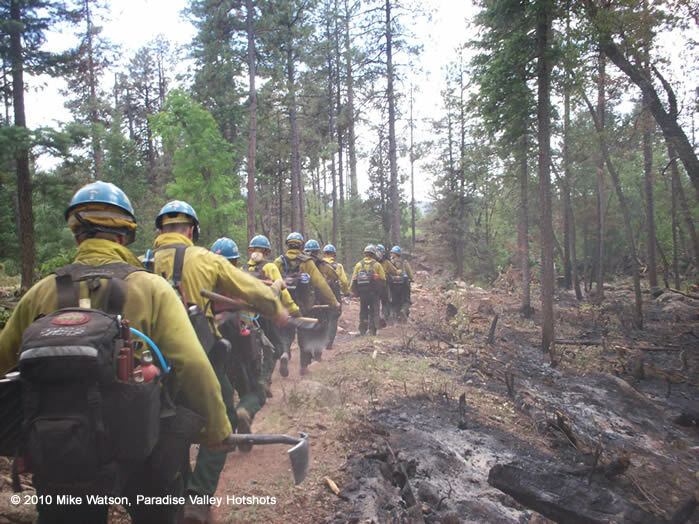 The Feather River Hotshots hike across the Lake Oroville Dam during their pack test; the Lassen Hotshots hike 12 laps around the track at Lassen Community College in Susanville, CA, and the Laguna Hotshots hike along the side of the road outside their station. Some crews have weight vests that you will wear during the test, while others use regular backpacks that have been filled to the appropriate weight. There is a difference between a weight vest and a regular backpack. The weight vest is easier to hike in because it evenly distributes the weight between the front and back of your body. Also, the weight plates hug your torso, and that keeps all the weight sitting directly over your center of gravity. With a backpack, all the weight is behind you, which forces your body to lean forward slightly to compensate. The result is that hiking with a backpack will have a more pronounced effect on your natural walking gait than hiking with a weight vest. For someone in decent shape, these differences are negligible, but they’re worth noting nonetheless. Many firefighters report that the most *challenging* part of it all is simply walking faster than you might normally walk. At the bare minimum, you need to walk at a 15 minute/mile pace, and most of your crew members will be walking much faster than that. If you’ve never fought fire before, or hiked with a hotshot crew, you’re probably accustomed to strolling around town at a leisurely pace. Well, you’re gonna have to pick it up for the pack test because “strolling” is something that hotshots don’t do. Take some time in the off-season and see how fast you walk around a track with a pack on. If you’re within a minute or two of 45 minutes after completing three miles, you need to quicken your pace. Also, stretching is very important prior to taking the pack test. Make sure you stretch out your calves, and lower legs. A common complaint while taking the pack test is shin splints, so be sure to take some time to warm up and stretch it out. The pack test is a stupid place to injure yourself. All in all, the pack test is relatively easy and if you’re following the training programs on this site, you’ll have zero problems completing it with plenty of time to spare! I’ve been training for my upcoming Arduous Pack Test on 11-5-15. I started a month ago with 25 lbs. until I hit my target time. I’m now at 45 lbs. in 34/35 minute range. I train two days, take the third off. How can I more efficiently/effectively train for this? My target time is 30 minutes. The test is a lot easier than you think. It was very intimidating at first. I made it in 42min, but time does not matter, even if you make it at 44:59 ! Although I highly recommend setting a quick pace at the .05 mark of the first mile to give you a 30sec buffer that will relieve any stress of cutting it too close. Too many guys took it easy on the first mile and cut in close in the end. I have my coming pack test next week my worries are my arthritis and my knee injury that cause me to move so slow and it’s bothering me. I’m 51 years old this fire season is the toughest season for me I hope I will pass. It’s my first time taking the test and I’m short as hell so my strides are small, any advice?